I appreciate that the words 'census' and 'lost' must never be used carelessly in earshot of an Irish genealogist, so I'm going to tread very gently here. Please read the entire post before panicking or crying. 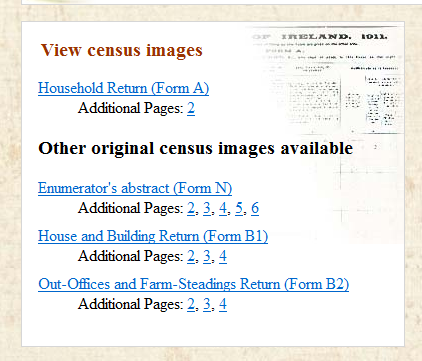 It seems some images from the 1911 census on the National Archives of Ireland's Genealogy site have gone AWOL ie performed a disappearing act. We're talking here of the non-household forms ie B1 Return of House and Buildings, which recorded the condition and features of each dwelling (numbers of windows, roofing materials etc), and B2 Return of Out Offices, which recorded deails of piggeries, cow sheds etc. They were there under 'View census images'. And now they aren't. I'm told that the matter has been referred to the NAI's web team and a fix is awaited. So the data is not lost. The images are just temporarily unavailable.